goth on holiday, originally uploaded by Bryan Ledgard. She's got a bat round her neck, someone's old blue dressing gown threaded through her hair but she's keeping cool with a 99 Flake! All hail the Queen of the Sunshine Goths! i love her hair!!!!! !lovely colour! wow! ice cream with a flake AND batwing! 666 flake? 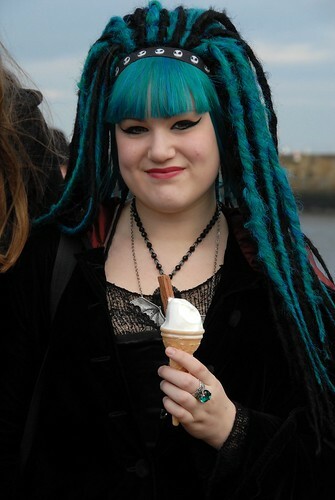 This gorgeous woman (Queen of the Sunshine Goths) the right idea--great clothes & ice cream (looks like bat-nilla)! Best wishes from northwest Pennsylvania, USA.